Chad Alice Hagen: Once Again - A New Year! Once Again - A New Year! And happy holidays! I am over the xmas blah, blah, blah. Had my big solstice party and since the end of the world didn't happen, I figured I was ready to start the planning for my favorite personal holiday - New Year's Day. I am a resolution junkie. I think it is a natural outgrowth of being a list maker and a big believer in the reinvention of self. And there is something satisfying to combine it all during a natural changing of the season. I'm off by a few days from the actual solstice but other than contacting NOAH and getting a current read on the exact timing of the solstice for my location (which as I write this I am wondering if that might be possible....) I like the idea of sharing resolution time with the rest of the world, on new year's day, sort of combining all of our collective efforts to give us all a greater conviction to follow through all those numbered lists. I checked my January 1 page of last years journal and read the usual-lose weight, exercise more, become smarter and beautiful, and realized that, except for the beautiful part, I actually HAD done those things. And realized that finally, after all those tired lists of past years, I could change my physical life. There is nothing more compelling than succeeding at something that normally has failure written all over it. I really feel that I can think, ponder and finally commit to writing, the magic wishes for this year, and believe that I can make them happen. 1. Write a blog post every Sunday. I follow a blog that posts every Sunday and I am quite taken with that regularity. It comes from Australia which means, I think, that I actually read it on Monday. http://rhondaayliffe.blogspot.com/ She has a fabulous imagination with books and their placement in the outback of her land. 2. Write more. Be a Writer. Answer all those vitual magazine calls for articles. Write my Blog more. Write the next book. Write real letters to people..... Find a decent fountain pen..... Use my own walnut ink..... Strain walnut ink on stove...... Buy more bottles..... Find the right journal with great paper..... Hey! 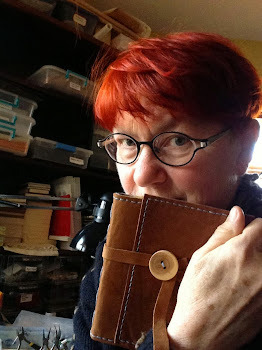 Bind my own journal..... Oh, make handmade paper for that journal...... Oh Oh, sign up to rent paper studio. the middle of first work on paper - not my own but I am in love with whatever it is. And that, I think, will be what I will focus on this year. There will be the lose the last 20 pounds, continue to eat veggies and protein (and a new plan - never keep cookies or chocolate in the house), do interval running/walking 3 or 4 times a week, sign up for maybe 2 or 3 5K runs and try to try the whole way, all those bits that keep my energy up. So what resolutions are you doing this year? I love the ability we all have as artists to re-invent ourselves at any time, but it is exciting at the New Year. A fresh start to combine with the fresh frosty air. And I would like to keep up with folks who are making some big changes in their lives. And finally my PaperWhites have bloomed on schedule, right when there is a frosting of dreaded snow on the ground. Thank you for the picture of the PaperWhites. My grandparents always had a small pot of them in the winter in Ohio. It sat on their dining room table in front of the big picture window made of individual panes of handmade glass. I was suddenly immersed in a warm blanket of their absolute love for me & the joy they took from each day of their life! Blessings in the new year! The new paper work is exquisite, miz Chad, can't wait to see & touch firsthand. As for lists & resolutions, I admire your steadfastness ~ I can accomplish the first, but can only aspire to the second. I am going to keep this quote VERY close at hand: "There is nothing more compelling than succeeding at something that normally has failure written all over it." a post every Sunday? yeah!!! I set my goal just before the New Year: save a wee bit each month toward another class adventure in SEPTEMBER 2013 - Madeline Island! Had such a great time in 2012 dying wool batts at Siever's. I want to learn to make brooches and books and, best of all, resist dye in 9 different dye baths!